GWER, Iraq—First you notice the sound of jet engines. The sky is overcast, so you can’t see the coalition warplanes. But you can hear them. And you know what the snarl of jet noise and the occasional thud of an airstrike symbolizes for the Islamic State fighters about a mile away. With a Kalashnikov slung over his shoulder and a curved dagger sheathed in his waist sash, peshmerga Col. Anwar Hassan watches his enemies through binoculars. Hassan, 48, has been a Kurdish peshmerga soldier since the 1991 Kurdish uprising against Saddam Hussein’s regime, and he fought in the Iraqi Kurdish Civil War in the mid-1990s. He also remembers the genocidal Al-Anfal campaign in the late 1980s when the Hussein regime killed about 180,000 Kurds through aerial bombardments, firing squads, and chemical warfare. Hassan commands more than 300 soldiers within peshmerga Unit 48. With about 1,000 total fighters, Unit 48 holds an 80-mile stretch of the front lines south of the Islamic State stronghold of Mosul in northern Iraq. The men under Hassan’s watch are spread along a 12-mile section of those lines, dug in on hilltops and in fortified compounds. Today, the peshmerga are under the command of the Kurdistan Regional Government, an autonomous Kurdish region in northern Iraq. They are an ally of Operation Inherent Resolve, the U.S.-led international coalition combatting Islamic State, the terrorist army also known as ISIS. As Operation Inherent Resolve approaches the two-year mark, the peshmerga have proven themselves in battle as the most reliable ground force against ISIS in Iraq. With some of Saddam Hussein’s former Baath Party now serving within the Islamic State’s ranks, Hassan sees the fight against the terrorist army as one more battle in a war he has fought his entire life. “We’re still fighting the same enemy,” Hassan says. “Do you believe you’ll ever live in peace?” this correspondent asks. “In sha’Allah,” Hassan replies. God willing. 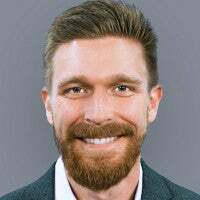 It is the day after an Islamic State attack on a village north of Mosul, in which 31-year-old Navy SEAL Charles Keating IV died by sniper fire. Tensions are consequently high along the peshmerga lines surrounding Mosul. Here, at a peshmerga position to the south of Mosul at a village called Gwer, the soldiers did not sleep at all the night before. They stayed up until sunrise ready to defend against a rumored Islamic State attack. More than 100 local Kurdish villagers took up arms to reinforce the peshmerga positions. The terrain is wide-open, colored tan and green. Eroded hills ring the horizon southward. To the east are fields of wheat. Islamic State positions are to the north and west in the direction of Mosul. No man’s land is a scrub-covered fluvial plain cut by the Great Zab River, a tributary of the Tigris. The peshmerga are dug in on a ridgeline running parallel the river among a network of hilltop forts and cinder block homes converted into outposts. On a ridgeline on the opposite side of the river about a mile away from the Kurdish lines, ISIS fighters scurry between their positions. An ISIS pickup truck with a machine gun mounted in the back bed is parked under a lone tree atop a hill. Nearby, two ISIS fighters fire a machine gun from inside a cemetery. They use a stone grave as cover. But the shots are sporadic and haphazard, and none of the peshmerga soldiers fire back. They need to save ammunition. A slit in the field about 80 meters (87 yards) from the Kurdish outpost marks the Islamic State’s closest point of advance. Bullet holes pockmark the walls of the compound facing the Islamic State lines. Alongside Hassan, other peshmerga soldiers stand behind a sandbag reinforced wall on the roof of their compound. They pass binoculars back and forth, watching their enemy. One peshmerga soldier turns up the volume on his radio when he hears ISIS fighters talking to one another. The Kurds don’t have encrypted communications; they share the airwaves with their enemy on off-the-shelf walkie-talkies. There are about two dozen peshmerga soldiers at this position. Most are armed with Kalashnikovs only. They have a pair of U.S.-made M-16 assault rifles for the unit, which the Kurdish soldiers say they took from dead Islamic State fighters. In a room on the second floor of the outpost, a set of night-vision goggles sits on the floor beside a rocket-propelled grenade (RPG) launcher—the only one of each at this position. In the compound’s courtyard there is a Toyota Hilux sport utility vehicle with a Soviet-made “Dushka” machine gun mounted in the back bed. The truck is parked so that the weapon is aimed over the compound’s wall in the direction of the ISIS lines. It is the Kurdish unit’s sole machine gun. The first thing peshmerga Gen. Shex Zrar offers is an apology. Unit 48’s commander puts a hand over his heart and explains that normally he would kill a goat to prepare a meal for an honored guest. In a command post several miles behind the front lines, Zrar has agreed to an interview with The Daily Signal. Before talking about the war, however, he extols the qualities of the goatskin roll on which he sleeps. “It is soft and keeps me warm at night; like a good woman,” he says, chuckling. 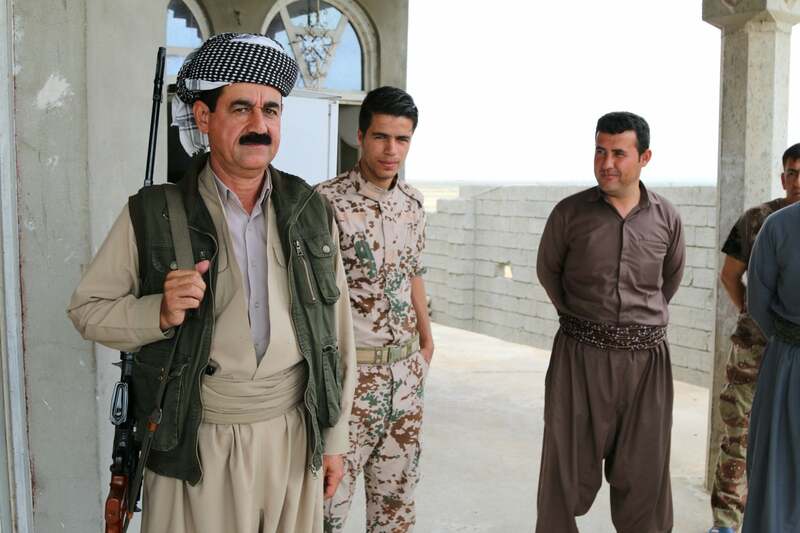 The peshmerga general wears a traditional Kurdish outfit with a thick waist sash over which is a belt laden with ammunition pouches and a holstered pistol. A checkered turban covers his head and he wears sunglasses, which he keeps on while sitting inside. Like most Kurds, Zrar uses his hands a lot as he speaks. His facial expressions are animated and eclectic. To make an important point, he places a hand on your forearm. A soldier brings in several glasses of sweetened tea and a plate of cookies. With the necessary formalities appropriately tended to, and a few minutes of pleasantries dutifully exchanged, the interview begins. Zrar promptly discloses his gratitude for American airstrikes. 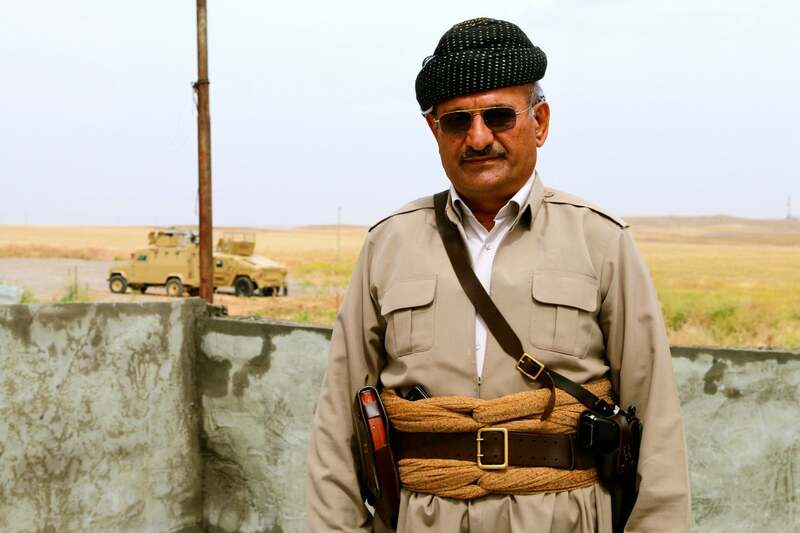 “America is our real friend,” peshmerga Gen. Shex Zrar says. Overall, Unit 48 is responsible for an 80-mile-long stretch of the front lines around Mosul. The peshmerga have divided their front in northern Iraq into eight sectors, and Zrar’s is the longest. Zrar is proud of his soldiers and says their morale remains high after two years of combat. Yet, he also insists the Kurds need more weapons and ammunition. The general blames shortfalls on Iraq’s central government in Baghdad, which he says has not followed through on handing over weapons the United States has pledged for the Kurds. Zrar says ISIS has an edge in firepower due to the quantity of Iraqi army equipment confiscated during their 2014 blitz across Iraq. The U.S. has pledged weapons and equipment for the Kurds, but all of the materiel is funneled through Iraq’s central government in Baghdad, which has proven reluctant to arm the Kurds. Apart from the May 3 attack, fighting along the front lines outside Mosul has been largely static for months. Similar to the ongoing war in Ukraine, it’s a long-distance fight in which soldiers on opposite sides of no man’s land fire at each other from hardened positions and trenches. ISIS’ daily attacks comprise mortars, heavy artillery, RPGs, and machine gun fire. Snipers are also a constant threat. Peshmerga say the ISIS snipers are well trained and lethal. ISIS also uses small commercially available drones for surveillance, peshmerga soldiers say. Zrar pushed back against the narrative that the Islamic State is inept on the battlefield and exclusively relies on suicide bomber banzai charges. Some former Baathist commanders who served under Saddam Hussein have joined the Islamic State, the general explains. They add command experience, which has translated into coordinated, complex attacks. “Veterans of Saddam’s army have joined Daesh, so they have good tactics,” Zrar says. The Islamic State has also adapted to the airstrike threat. They now wait to launch attacks on days when it is raining or cloudy—weather that makes it more difficult for U.S. and coalition warplanes to find targets. And they hunker down in caves and underground tunnels, constantly shifting their command posts to elude aerial surveillance. Yet, many peshmerga soldiers also claim ISIS is on its heels. They say coalition airstrikes have had a devastating effect on their enemy. Zrar claims the May 3 Islamic State attack was done purely for propaganda value, part of the group’s desperate attempt to rejuvenate recruitment, which at about 200 new fighters a month is now less than one-fifth the pace of last year. Most of the peshmerga soldiers in Unit 48 are not young men. While the youngest soldier is just 18, the majority are middle aged or older. Some have gone completely gray. Many of the older soldiers have combat experience dating from the 1980s. “We know how to suffer,” Hassan says. Life on the front lines is Spartan for peshmerga soldiers, with little financial reward or recompense for their service. At night on the front lines in Gwer they sleep atop goatskin rolls either laid out in a ground floor room or on the roof—a common practice in the Middle East to escape the heat. Yet, due to the constant threat of ISIS attacks, the Kurdish soldiers often stand guard through the night. 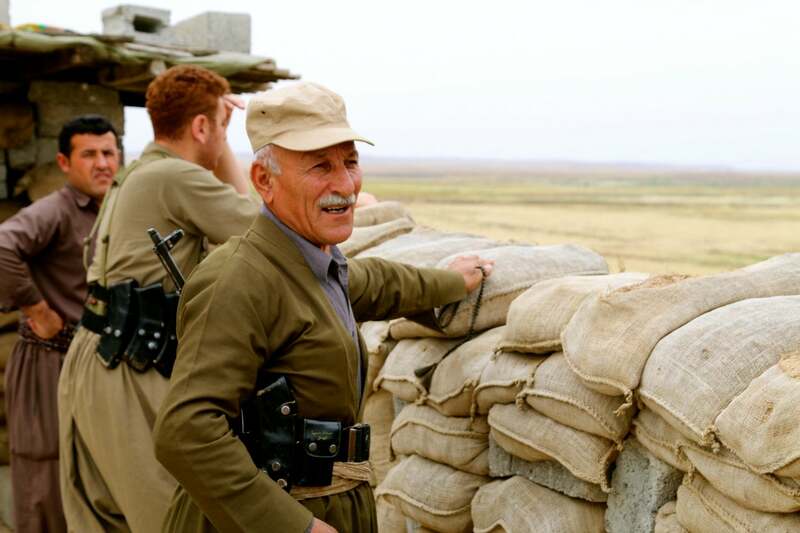 Many of the peshmerga soldiers are middle aged or older. A normal peshmerga soldier makes $300 a month and is responsible for buying his own weapon, ammunition, and clothing. Currently, there is a three-month backlog in pay. Consequently, most peshmerga soldiers have a second civilian job, which they balance with their military service. They rotate home about every five days and spend half of every month on the front lines. At the Gwer front, none of the men have body armor and they are short on food and medical supplies. Unlike U.S. soldiers who carry individual first aid kits called IFAKs, this peshmerga unit has a communal supply of medical supplies with which to treat the wounded. It is a 30-minute drive to the nearest hospital. Despite the lack of equipment and weapons, the Spartan way of life, and two years of constant combat (preceded by decades of genocide and bloodshed), the peshmerga’s morale appears robust. They seem animated, energetic and sociable. They pass time playing dominoes and drinking tea. Few appear forlorn, or are seen sitting alone or idle. As is the case at other contemporary battlefields, such as the one in Ukraine, the front lines in northern Iraq offer a bizarre juxtaposition of ancient fighting methods cast against the trappings of modernity. Coalition fighter jets and drones orbit overhead, using laser-targeted munitions to snuff out Islamic State fighters hiding in caves. Meanwhile, peshmerga soldiers in World War I-style trenches and atop ancient hilltop forts, wielding World War II-era weapons, observe the technological might of modern air power. Most of the older peshmerga soldiers wear a traditional outfit called a “sal u sepik.” It consists of baggy trousers, a waist sash, and a V-necked jacket. They also wear a checkered turban and some keep a curved dagger sheathed in their waist sash. Many thumb prayer beads as they stand watch. Except for the Kalashnikovs slung over their shoulders, they wouldn’t look out of place among Kurdish warriors from hundreds of years ago. Peshmerga commanders say morale remains high among their soldiers. The younger soldiers, however, prefer modern military fatigues. Some wear T-shirts with “U.S. Army” embroidered over the breast pocket. Keeping with Kurdish culture, all of the men are neatly groomed with fresh haircuts and combed hair. Those who wear mustaches keep them trimmed. The soldiers smile and crowd around for the camera. The older ones stand tall and at attention for photos. The younger among them flash peace signs and give a thumbs up. There is spotty cellular Internet connection here, and some soldiers troll Facebook on smartphones during downtime. They also use Facebook to verify the credentials of the foreign correspondent in their midst. For the peshmerga, the fight against the Islamic State is an existential struggle to defend their homeland and their families. There is no question about the war’s necessity or the justice of their cause. Part of their motivation stems from the savage brutality of the enemy they face. Abdul Rahman joined the peshmerga in 2004, the year after the U.S. invasion to topple Saddam Hussein. He was 18—the minimum enlistment age. Even with potentially bloody battles like the one for Mosul looming on the horizon, the Kurds say the Islamic State’s downfall is inevitable. The greater unknown, however, is what happens after ISIS is defeated. Simmering tensions with Iranian-backed Shia militias, which reflect long-standing sectarian tensions in Iraq, have many Kurds anticipating a civil war. 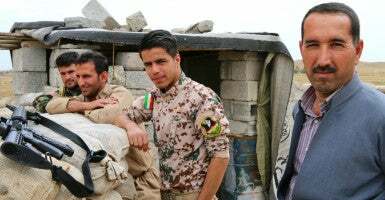 Many Kurds believe they have done the heavy lifting in the fight against ISIS and have proven themselves as the most effective ground force in Iraq. 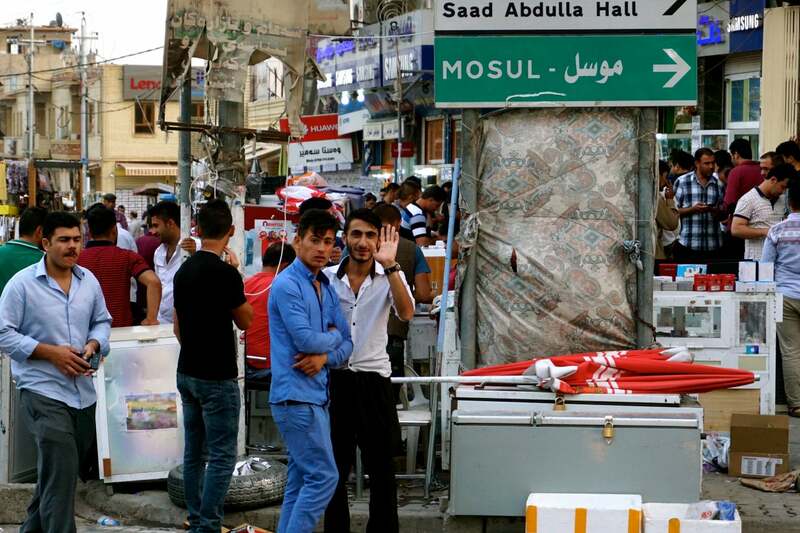 Thus, they say they will have earned their long-awaited independence from Baghdad after the Islamic State’s defeat. U.S. military personnel say the campaign to liberate Mosul will be a tipping point in the war against the Islamic State. The looming campaign to liberate Mosul could be a tipping point in the war against ISIS. While U.S. President Barack Obama has said Mosul could fall to Iraqi forces by the end of the year, most military analysts and many U.S. and Kurdish military personnel in the field say the siege will likely have to wait until 2017. Yet, despite the mounting anticipation for the Mosul campaign and its potential to deal a lethal blow to the Islamic State, many rank-and-file peshmerga soldiers consider the city’s liberation to ultimately be Baghdad’s responsibility. They feel betrayed by the Iraqi central government’s stalling on weapons deliveries tagged for the Kurds. The Kurds also have low regard for the fighting will and combat skills of the Iraqi army. “But if Barzani tells us to attack, we will,” Hassan adds, referring to Masoud Barzani, president of the Kurdistan Regional Government. The peshmerga lines stretch for more than 200 miles across northern Iraq from the city of Sinjar in the north near the Syrian border to the outskirts of Kirkuk, 100 miles southeast of Mosul. The peshmerga front is divided into eight sectors, each with a local commander. The northernmost permanent Iraqi army positions are in Makhmour, about 40 miles southeast of Mosul. The process for the peshmerga to call in coalition airstrikes is laborious. Coalition military personnel say the convoluted chain of approvals prevents civilian casualties and compensates for situational awareness shortfalls due to the absence of coalition troops on the ground. 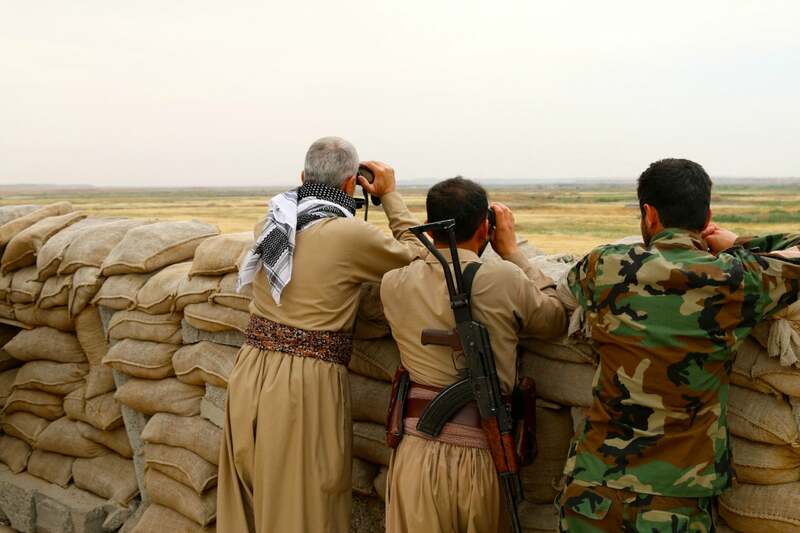 Peshmerga soldiers observe ISIS positions at a front line position south of Mosul. To call in an airstrike, a peshmerga soldier first radios a Kurdish command post behind the front line. The Kurdish commander or officer in charge then contacts the Kurdistan Region Security Council operations center in Erbil, where the request is then walked over to an adjacent coalition operations center. A U.S. military member trained to direct airstrikes from the ground, called a joint terminal attack controller, or JTAC, reviews the request. From there, the request is passed on to an operations center in Baghdad and the Combined Air Operations Center at Al-Udeid Air Base in Qatar. At that point, if the airstrike is approved, the coalition tasks a warplane (manned or unmanned) to conduct the mission. According to the peshmerga soldiers in Gwer, airstrike requests typically take between five to 30 minutes to materialize after the initial call. Sometimes, the soldiers add, their request is denied—likely due to an inadequately precise description of the target or the presence of civilians. Without laser targeting capability or precise GPS devices, peshmerga soldiers must provide a general description of a target’s location. It can be as simple as describing nearby landmarks like trees or power lines, or even using the color and shape of a structure to guide pilots’ eyes onto a potential target. Despite the myriad difficulties and potential pitfalls of the airstrike process, coalition commanders tout Operation Inherent Resolve as the most precise air campaign in history. 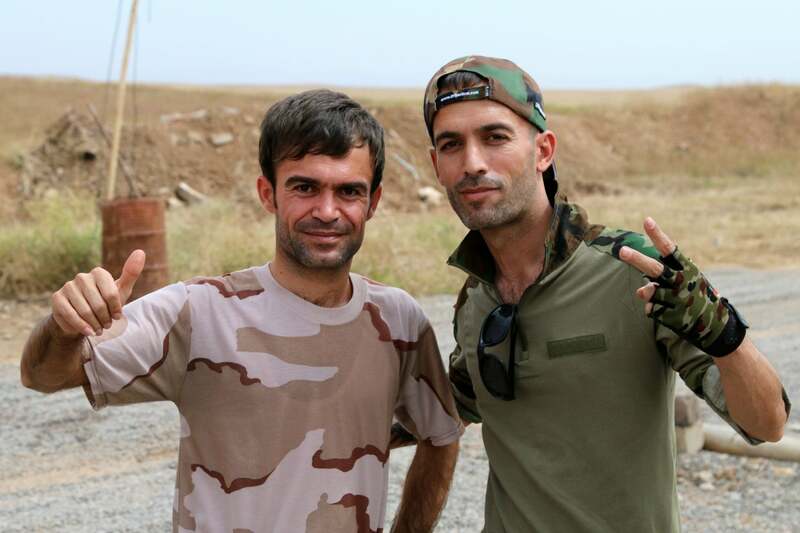 The peshmerga say airstrikes have been a game-changer on the battlefield, both operationally and as a morale booster. “Our success depends on the U.S. airstrikes,” Zrar says. Leaving the front lines you pass two children playing on the side of the road, a boy and a girl. They are only about 3 miles or so from the front; you can still hear the sounds of the war from here. Yet, they seem oblivious to what the pops, booms, thuds, and jet noise mean. They keep playing as you pass by and the war goes on.